What I’m Reading: I flew through Gayle Forman’s Just One Night, the eNovella follow-up to Just One Day and Just One Year, and it was a complete joy. I am so, so happy she decided to put a cap on Allyson’s and Willem’s story. I also read Roxane Gay’s An Untamed State, which was the exact opposite of joyful. To be honest, I feel sort of terrible recommending it because it is absolutely brutal. But, it is also brilliantly written and completely haunting (I had nightmares) and, I think, a must-read. 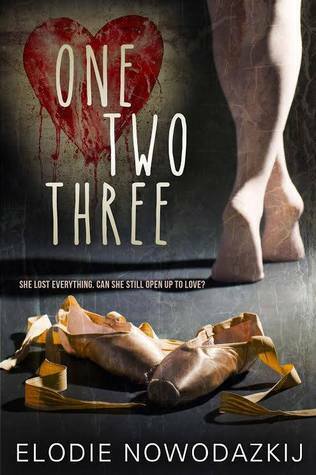 Now, I’m reading my friend Elodie Nowodazkij’s up-and-coming YA debut, One, Two, Three, and I am loving it. What Else I’ve Been Up To: Tomorrow is my girl’s last day of 1st grade. *sob* I’m struggling with how quickly she’s growing up, so I’ve been spending more time than usual helping at at her school. So fun to see her in her element! Hula hooping at recess, and an end-of-the-year Water Day celebration. Last week the Scholastic Book Fair was held at my daughter’s school, and then we took a trip to Books-A-Million over the weekend. We’ve amassed a nice little summer reading pile. (Thanks for the excellent recommendations, Temre!) Looking forward to diving into these with my girl! Where should we start? What’s Inspiring Me Now: My friend Jessica Love, whose debut novel Push Girl (co-authored with Chelsie Hill) released yesterday. I adore this book, and I enthusiastically encourage you to read it. My Bookanista review is HERE. Also, Ready. Set. Write! Have you heard about the summer writing intensive I’m hosting with Alison Miller, Jaime Morrow, and Erin Funk? We’re setting goals and cheering each other on through a summer of fun and productivity… Join us! My daughter loves all sorts of fairy tale adaptations, so she’s very excited to read EVER AFTER HIGH. I am too! Good luck surviving the middle school phase… Crazy how quickly these kiddos grow up! I’m currently reading my first ever Gayle Forman book (IF I STAY) and am mourning the fact that I can’t sit down and devour it all in one sitting. I’m a little behind the times on that. I see at least one book in your daughter’s pile that’s been on my TBR list forever–the one by Kate DiCamillo. Her books are such a pleasure to read out loud because the prose just flows so beautifully. The WIP you’re drafting sounds so good! 27k is awesome and I bet that will sky rocket with RSW starting up! Hope the plot element gets sorted out with your other story! Oh my gosh… IF I STAY. The book that made me want to write YA. 🙂 I love and own everything Gayle Forman has written. I think she’s brilliant! Of the books in our summer TBR pile, EDWARD TULANE is the only one I’ve read and I adore it. So beautiful and moving. Kate DiCamillo is awesome. Have a great week, Erin! I’m looking closely at your daughter’s stack of books b/c my niece is the same age and I’m always at a loss on what books to buy her – I worry I’m picking things too easy or too advanced. I’ve read EDWARD TULANE and I adored that rabbit, even when he was at his most arrogant. I’m going to my brother’s high school graduation in a few days and it’s so surreal – it feels like his kindergarten graduation just happened. Of all those books, EDWARD TULANE is the only one I’ve read. I borrowed if from the library last year and loved it so much, I had to buy it. I love Kate DiCamillo! Looking forward to diving into the rest of those. 🙂 Congrats to your brother on his graduation! Crazy how fast these kids grow up! And yes, I hope you do join us for RSW. It’s going to be a fantastic summer! Wow sounds like you are busy! 27k is AWESOME! I am slowly beginning agent revisions. SLOWLY. I am nervous about doing this right, but my CPs keep reminding me to not get stuck at 25 pages…to keep going… I also wanted to say I loved THE O&O IVAN. I rarely read middle grade anymore (I think it’s because I hold so dear the ones I read as an actual MG — Sarah Plain & Tall, Island of the Blue Dolphins, Julie of the Wolves, etc.) but something about this one struck me. I’m really looking forward to reading IVAN. I remember seeing the real Ivan as a kid. He spent, like, 27 years living caged up in a sketchy mall in a city near where I grew up. So sad. Obviously I’m super curious about this more fantastical version of the story. Also, ISLAND OF THE BLUE DOLPHINS — love! One of my favorite MGs too. Best of luck with your revisions, Rachel! I saw your Instagram post about AN UNTAMED STATE and added it to my TBR list because it sounded great (and terrible at the same time?). Congrats on hitting 27K on the new project. You’re flying through it! I’m so excited for Ready, Set, Write! I might be doing a lot of plotting/outlining at the beginning, but I’m so in on this. Yay! I was hoping you’d join us, Trace! And yes, you should most definitely read AN UNTAMED STATE, so long as your tolerance for disturbing images is HIGH. It is truly amazing and terrible at the same time. I read JUST ONE NIGHT in 30 minutes. It’s super short and well worth the time. 🙂 I hope you get a chance to read it tonight! I’m not sure that I would use the word “gore” to describe AN UNTAMED STATE, but a woman is kidnapped by a gang of men. Wherever your imagination goes with that info, multiply by fifty. It’s awful, but an incredibly well-told story. Hope you have tons of fun with your kiddo this summer! I am currently reading PUSH GIRL and really liking it! I really should get to Elodie’s book soon. I think it’s probably changed a good deal since the last version I read, so that’s kind of exciting. 🙂 The story you’re working on sounds FANTASTIC! I love road trip books. With romance. And mystery. So, you know, it sounds like it’s right up my alley. Hope you’re having an awesome week! Can’t wait to get started on RSW with you! Thanks, Jaime! I’m enjoying ONE TWO THREE so much. It’s just the sort of contemporary YA I gravitate too. I can’t wait to find out what happens with Nata and Tonio! Have a great week, lady! Your new WIP sounds amazing, definitely something I’d want to read. Happy drafting! Thanks, Ghenet! I can’t wait to hear about what you’ll be working on for RSW this summer. Have a great week, lady! I definitely need to read Just One Night. I lived JOD and JOY and I want to hear how it ends! I just keep forgetting to download it. Good luck with your WIP- sounds fun! Must read soon, Melanie! It’s fabulous! I’m impressed by people who can regularly have two projects going at once. My brain does not work that way at all. The only reason I’m having success now is that the projects are related. Phew! Any fun summer activities planned for your kiddos, Prerna? I loooove the pictures of your daughter. Totally envy your photographic skills. And your WIP sounds so fun; I love road trip books! Thanks, Crystal! Though, my “skills” are all in the editing. 🙂 I love road trip books too. 🙂 Have a great week, lady! I’ve said it more than once, but I’ll say it again–the cover to Elodie’s novel is superb! Very atmospheric. I’d certainly pick it up if I saw it in B&N. I hope you make awesome progress on your writing projects this week. I love the cover of Elodie’s novel too, Colin! And the story behind it is equally fantastic! And thank you for complimenting my mom skillz. 😉 Occasionally I have one of those parenting FAIL days, but don’t we all? Doing my best! Have a wonderful week, sir! Wow, what a busy week, Katy! Sounds like you’ve been a productive machine on the WIP – I love that you’re in love with your characters (and their love, haha), isn’t that such a great feeling? I hope so too, Caitie! So looking forward to making my goals public. That way I’ll have no excuse to slack. 😉 Have a great week, lady! You must start with THE MIRACULOUS JOURNEY OF EDWARD TULANE!! Ok, I’m biased because I just remember how much both my girls loved that book and how much I loved reading with them. 🙂 I can’t wait for Ready, Set, Write! EDWARD TULANE is the only one of those books that I’ve read, Kitty. I checked it out from the library last summer and LOVED it. Spotted it at the bookstore with my girl the other day and decided we should have it to read together. 🙂 Looking forward to RSW with you!